Orientation Week often raises the eyebrows of many at and outside of McGill University, mainly because of just one of its components: Frosh. Mention the word “Frosh” and it will incite a myriad of reactions from McGill staff members, local residents, upper-year students and alumni. Orientation Week is one of the largest events organized at McGill, a nine-day period encompassing all the different events for incoming students hosted by a number of campus groups and offices. Held at the end of Orientation Week, Frosh is a series of days filled with events and activities for incoming students. “Frosh” is an umbrella term to describe the programming organized by a particular Faculty, School, or interest group structured around orienting all new McGill students to the University and to Montreal. Just a mention of the word Frosh will elicit an eye roll from many people, who seen it as just one big party. Although there is a history of events and incidents that can justify this interpretation of Frosh, oftentimes this stance is just that: a carry-over from when Frosh was something much different. I say “different” because this view of Frosh casts a negative shadow on McGill Orientation Week as a whole, which as an event and community project has actually grown leaps and bounds in the past few years and continues to better itself. Now in its third year, McGill’s Integrated Orientation Week project has resulted, in part, in the creation of the Orientation Planning Group (OPG), a steering group made up of staff and students from across campus; student-chaired working groups; and task forces focused on specific topics, such as inclusive programming and training. A weekend retreat held in May orients new Frosh co-ordinators to the responsibilities of the position, allows them to share knowledge and relevant information, and formulate goals and initiatives for the upcoming summer. 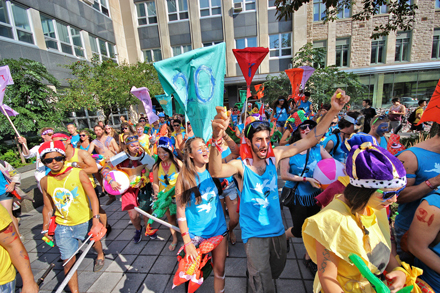 Currently there are a number of groups involved in organizing Frosh: the Students’ Society of McGill University; the Macdonald Campus Students’ Society; 12 different faculty, departmental and school student associations; and five different organizing committees made up of various interest groups. In all, more than 4,000 incoming students take part in Frosh. What’s more, the completely student-run event is organized and executed by more than 80 student co-ordinators and 1,000 student volunteers. Together, that’s more than five times the size and scope of most national professional association conferences. Most incredibly, the programming, sponsorship, tech support, volunteer management and logistics for these large-scale events are handled entirely by committees of students ranging from two to 10 members large, supported as necessary by other campus partners of the Integrated Orientation Week project. Through the Orientation Planning Group and the hard work and dedication of its student and staff members, Frosh has expanded its volunteer training, developed an integrated website (www.mcgillorientation.ca), and increased collaboration between student organizers. In 2013, through collaboration with Student Services’ Campus Life & Engagement unit, Frosh organizers have committed to a variety of new goals and initiatives that will help address some of the past issues surrounding Orientation Week. We believe we can ensure McGill’s incoming class enjoys the safest, most entertaining week possible, while ensuring the long-term sustainability of the event. Our new initiatives include, in part, a multi-platform communications system where students and the general public can leave anonymous messages about Frosh; roaming “harm reduction” teams staffed by students; welcome guides for new students who promote appropriate behaviour on and off campus; and digital incident reporting systems for students who violate their contract or the rules of Orientation. Given the sometimes negative perceptions of Frosh held by some members of the McGill community and some of our neighbours, the emphasis student organizers have placed on balancing student enjoyment, safety and inclusivity has amounted to a much more integrated and well-received Frosh in recent years. Of course, no event of this size can be executed without its incidents and problems, and we are aware that there have been a number. Everyone should know that while our history is not unblemished, we as student organizers are committed to ensuring that the event as a whole can be a welcoming and positive experience for all new McGill students. We understand that our work is part of a multi-year, evolutionary process and hope that those in and out of McGill appreciate that and work with us as we continuously improve the Frosh experience for everyone. Organizing Frosh can often feel like a thankless job. It is one that rarely brings positive attention when everything is going well, but attracts copious amounts of criticism when things go wrong. Support from the University allows us both the ability to focus our efforts on running one of McGill’s largest and most visible events, while also giving us the recognition that our attempts to welcome our peers are important to the fabric of student life. The more support, the bigger the change – and with increased amounts of both, Orientation Week and Frosh can solidify themselves as crucial steps in the trajectory of our students’ development and as events of which the University can be proud. To leave a recorded, anonymous message for the Orientation Communications team about anything negative or positive you are seeing or experiencing during Orientation Week, please call 514-900-0125.